This classic game of the Fantasy Monster Slug-a-thon is a standby from the Avalon Hill of yore. The game still has a very devoted following, which is a tribute to the depth of the various strategies and approaches. The game is divided into two realms, the masterboard and the battleboards. On the masterboard, legions of mythical creatures roam about trying to recruit bigger and badder monsters and kill opposing legions in the process. When a combat occurs, the action moves to the corresponding battleboard type corresponding to the area the fight is taking place in. After lots of dice are tossed, the army that remains standing is returned to the masterboard with the spoils of war: points. The points are used to recruit Angels and Archangels and to augment the leader character of the player's army: The Titan. As the points increase, the Titans become ever more powerful; at game end, the titan is able to kill most other character with a single blow. But be careful: If the Titan dies, the player is out of the game. The last Titan standing is the ruler of all, and winner of the game. Titan, ahhh yes I remember my youth. When I worked only part time because I didn’t HAVE to work full time. Not a care in the world. Those were the days in which I played Titan. Because I could afford to burn 8 hours on a board game. Heheh, not to say that this is not a fun game because it is. Drive around picking up various creatures of differing strengths and abilities building stacks of amazing beasts with which to attack and defeat your enemies. What could be better? 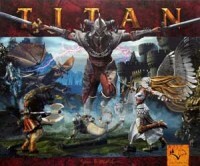 But…Titan definitely comes with a time commitment that some gamers are simply not willing to make. Many a day when we had to end early because some guy’s wife called wondering where he was or some girl had to go pick her kid up from school or some other silly reason. But for those of you willing to go the distance, it can be very satisfying. The creatures are very cool, and I found myself always dreaming of getting that awesome Angel or Dragon, but rarely found myself able to reach it. Perhaps it was just plain bad luck, or perhaps it was I played it with a couple of fanatics who were ruthless and would gut me at the earliest chance they got! Overall, it is a really fun game for the first half and sometimes it can drag on for the second half. It depends on the players and luck. I like the separate combat map, it made battles much more playable than just on a tabletop. I would definitely place this game in the Power Gamer, Strategy or Avid Gamer slots only. But for those gamer types, it can be a great way to spend an afternoon…and evening…and night. Add a Review for "Titan"